We’re still working on the Arabic alphabet with Mr Z and I’m always looking for playful ways to reinforce his learning. 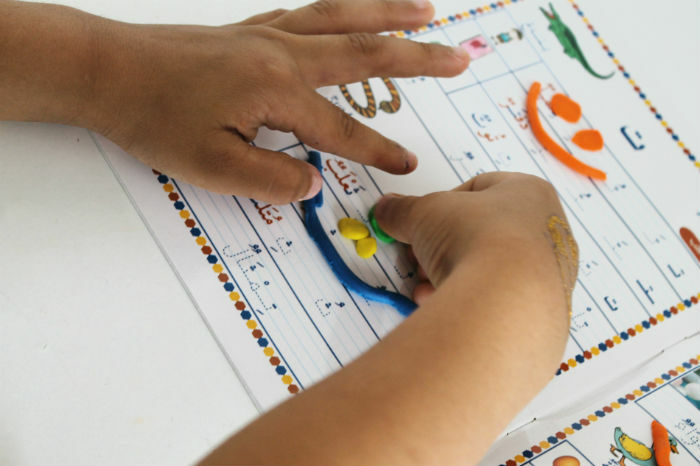 Since we have some Arabic alphabet books with shiny wipe clean pages, they also work great as playdough mats and I decided to give him some plasticine to work on shaping the letter and matching them up to the letters in the book. This will also work fine with any type of playdough but we used plasticine as we had plenty on hand in the cupboard. If you don’t have a wipe clean Arabic alphabet book (ours is from Morocco, thanks to my Father in Law who brings them for us!) 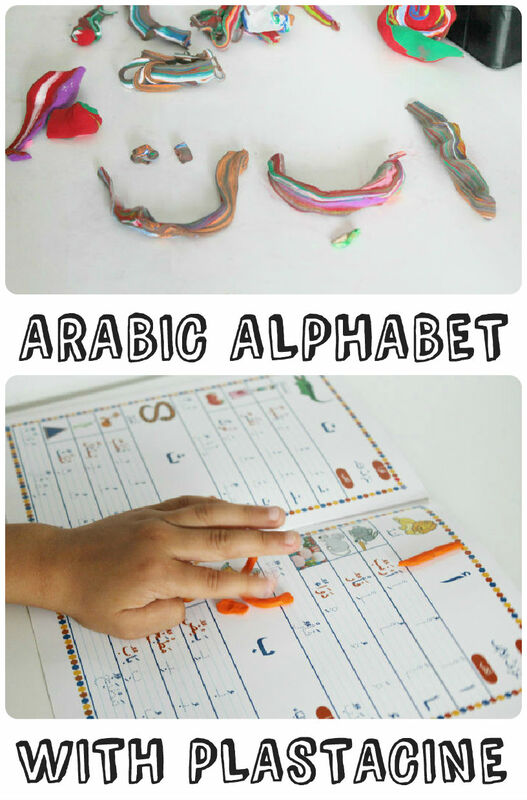 then I have created some basic Arabic alphabet printables that you could laminate and use for this activity. Once laminated, they would then wipe clean and be reusable for any other activity too. Shaping the letters is a very tactile kinesthetic way of learning. 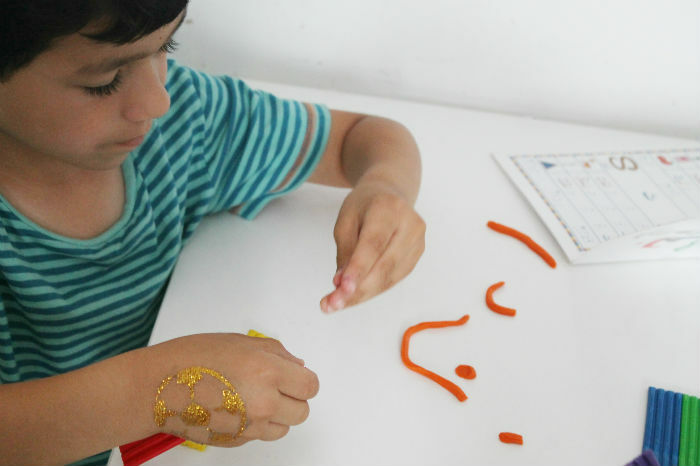 When our children are learning the English alphabet we do all these types of activities and give them time to learn through play and absorb the information by doing and playing, so I want to use the same methods for Arabic learning. Mr Z was keen to get started on the activity and to show the letters and words that he knows. To reinforce and extend the learning I would repeat the letters together with him while we made each one, and read the other words in the book for each letter. If you are using the basic printable mats you can add extra words verbally, getting your child to listen out for the letter sound at the beginning, middle or end of the word. You could also work on making the initial, medial and end forms of the letters as well as the isolated forms. Perhaps we will move on to this next time. You could then use those models to build Arabic words. Some letters are easier to shape than others, as you can see by our Ta here but with playdough or plasticine you can just roll it back into a ball and then try again. For children who get frustrated at mistakes in their written work, this can be a low pressure way to work on the letter formations as part of a fun game. this is a wonderful idea, I shall have a go at this with my son. Wow this is excellent. 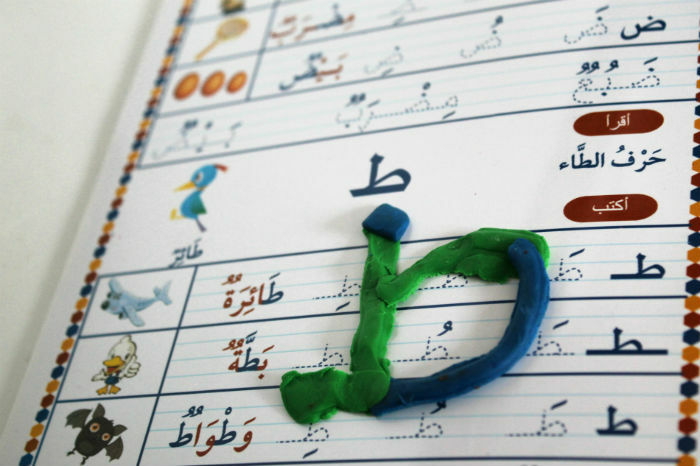 I always have a difficulty to teach my 4 years son an arabic using book so i think this plastacine is a great idea!! Very clever idea, I think that anything that gets mind and hands working at the same time is great to really reinforce learning. Mummy of Two recently posted…A soggy day at Edinburgh Zoo! My little one (almost 2!) just started going to daycare and they play a lot with playdough. I hadn’t used it at home with her much because I am always afraid of where it may end up but this is a really cool little project. We can work on letters and fine motor skills all while working on our minority language! Thanks!